Rahul Gandhi on Wednesday alleged that Narendra Modi as Gujarat Chief Minister had taken money from Sahara and Birla groups and demanded an independent inquiry into it, a charge the Bharatiya Janata Party rejected as an attempt to divert attention from the AgustaWestland probe in which the names of Congress leaders and the "family" were coming up. Addressing a rally in Mehsana in the prime Minister's home state, Gujarat, he alleged that in the Income Tax records there are notings of Sahara officials' claims that they had paid nine times to Modi between October, 2013 and February, 2014. Gandhi said the documents in this regard were with I-T department which had raided the company when Modi was Gujarat chief minister. Similarly, as per documents with I-Tdepartment, the Birla group also paid Rs 12 crore to Modi when he was the chief minister. Last week, Gandhi claimed that he had evidence of "personal corruption" of the prime minister but he was being prevented from speaking in the Lok Sabha because it would cause an earthquake. Reacting to Gandhi's allegations, Union minister Ravi Shankar Prasad said in New Delhi that the charges are "baseless, false, shameful and mala fide" and an attempt to divert attention from the AgustaWestland probe as names of Congress leaders and the "family" are coming up. "People of India have stopped taking him seriously. Rahul Gandhi is just bluff and bluster. There is no substance in what he says. He is just showing his and his party's incompetence," he said. 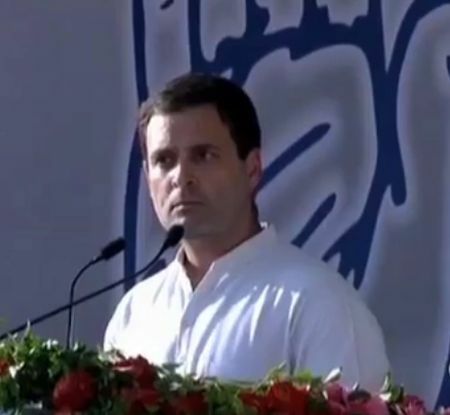 "PM Modi takes bribes and then shamelessly foists Demonetisation on Indians under the garb of 'fighting Black Money," Congress tweeted after the rally quoting its Vice-President Rahul Gandhi. "Rahulji asks if Modiji received this money from Sahara or not? If this document is with Income Tax, will Modi now investigate it?," tweeted party chief spokesperson Randeep Surjewala. NGO Common Cause had filed a PIL on the issue in the Supreme Court and a bench headed by CJI-designate Justice J S Khehar last week had refused to take up the matter saying there was no evidence but only allegations against the prime minister. The bench then asked lawyer Prashant Bhushan to provide evidence before it could decide on whether it could admit the petition. Gandhi alleged that the I-T records show Sahara officials' claims of having paid Rs 40 crore to Modi on various dates between October, 2013 and February, 2014. "You (Modi) did not allow me to speak in Parliament. I did not know why you did not wanted to face me in the House. I tell you the reason. Any business entity keeps record of its transactions. On November 2014, Income Tax department conducted raids on Sahara, a very large corporate house," he said. "During that raid, I-T department found some documents, which are on record. I want to share with you the contents of those documents. There were several entries in those documents, which I am reading out before you," he said. He then alleged that another record suggests that Birla Group gave Rs 12 crore to 'Gujarat chief minister'. "This record is with I-T department since last 2.5 years. I-T even recommended to conduct an inquiry in this issue. I want to ask you why no such inquiry was done? We want to know whether it is true that money was given to you nine times by Sahara?" Rahul asked. "You doubted the honesty of citizens, their hard-earned income, and made them stand in the queues. Now, on behalf of citizens, I am asking you whether the information is true or not. And if it is true, then when you will set up an inquiry," said Gandhi.